MANILA – Save our Schools (SOS) Network countered the claim of Armed Forces of the Philippines spokesperson Col. Edgar Arevalo that the military is not planning an all-out war against the New People’s Army following the postponement of formal peace negotiations between the Government of the Republic of the Philippines and the National Democratic Front of the Philippines. In a statement, Rius Valle, SOS spokesperson said the closure of 72 Lumad schools are proof that there is an all-out war – if not with the NPAs but with the Lumad schools and its communities. He is wary that the postponement of peace talks would mean deployment of more troops in Lumad and peasant communities. 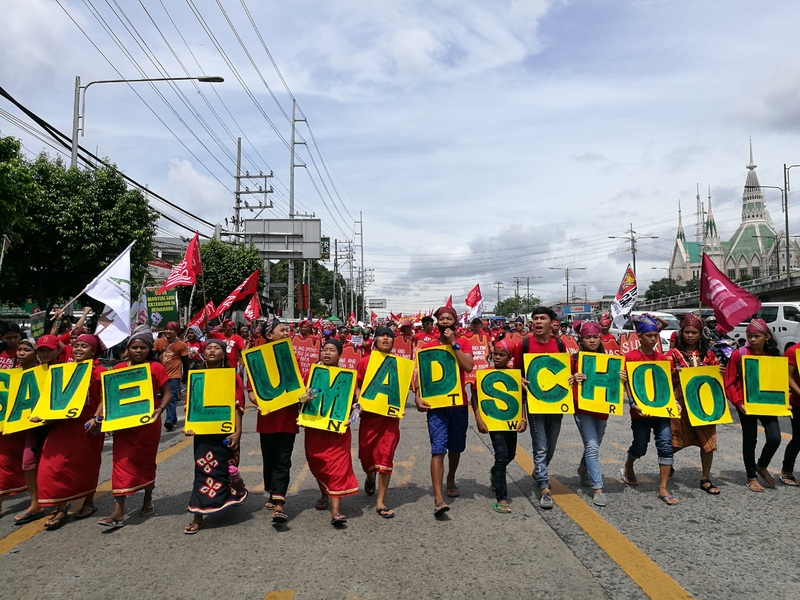 “Whether they call it an all-out war or all-out peace, the fact is 72 Lumad schools all over Mindanao have not begun their classes because of military encampment and harassment in their communities,” said Valle. The 72 Lumad schools include Salupgongan Learning Center, Mindanao Interfaith Services Foundation, Inc. and Center for Lumad and Advocacy and Services Lumad schools from Lianga, Surigao del Sur; Compostela, Compostela Valley; Talaingod, Davao del Norte and Sultan Kudarat. Some 2,000 Lumad students are now not in schools due to the reported attacks. 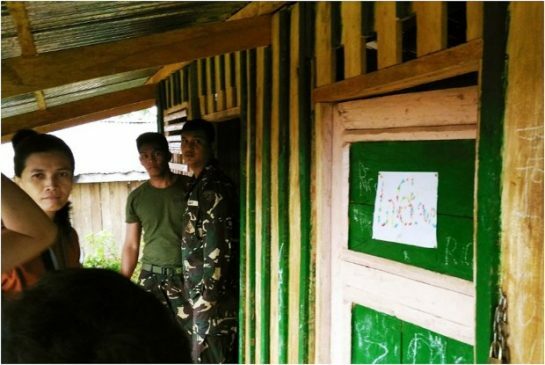 Valle said they have noted several incidents of military encampment at Kalamansig, Sultan Kudarat, in Compostela, Compostela Valley Province and another in Agusan del Sur while five incidents were reported in Talaingod. Valle said in barangay Ngan, Compostela, the military warned the community members not to enroll their children to Salugpongan schools as this was in “violation of their agreement to surrender.” This would also mean forfeiture of their 4 Ps or Pantawid Pamilyang Pilipino Program. As a result, six students were forced to drop out after the military deceived them to join or enroll in TESDA. But they were detained instead and was subjected to forced surrender. Under President Duterte, Valle said, they have documented at least 535 cases of attacks against Lumad schools or an average of one incident of attack per day. “The Duterte government is horribly violating national and international laws of protecting civilians, especially children and schools, from military attacks,” Valle lamented. Also June 15, 40 soldiers from the Marine Battalion Landing Team 2 (MBLT 2) led by 1st Lieutenant Ilagan started to encamp in barangay Datu Ito, Andog, Sultan Kudarat. The area is reportedly near a community school of the Center for Lumad Advocacy, Networking and Services (CLANS). According to Karapatan, the soldiers were reportedly looking for CLANS teachers and told them that Mayor Ronan Eugene Garcia instructed them to close the school. “They also offered P100 ($2) to Lumad students for information on the whereabouts of the teachers, who were in a week-long lobbying campaign at the Department of Education (DepEd) Region 12 in South Cotabato for the release of the long-delayed permit-to-operate certificates for the said school,” the group said. The Tribal Filipino Program in Surigao Sur (TRIFPSS) also reported that on June 14, around 5:00 a.m. an estimated 100 military troops and members of Civilian Auxiliary Forces Geographical Unit (CAFGU) under the 75th Infantry Battalion Philippine Army arrived at the Manobo community of sitio Simowao, barangay Diatagon, Lianga, Surigao del Sur. “They encamped at the houses of residents, at the community corn mill building and behind the Simowao Community Learning Center an alternative school run by TRIFPSS, endangering Manobo learners and volunteer teachers,” the group said. The 75th IBPA also filed a resolution on Feb. 5 at the barangay council of Diatagon to put up a military detachment in sitio Simowao which was eventually allowed and approved by the barangay council. TRFIPSS asserted that it was a violation of the Lumad’s right to Free Prior and Informed Consent (FPIC) which is stated in Indigenous Peoples Rights Act (IPRA). Meanwhile, the six teachers who were reportedly arrested by soldiers in Hayon, San Miguel, Surigao Del Sur while conducting Parents Teachers Conference meeting on June 20, were released June 21. Alerts sent and posted by TRIFPSS in the social media as well as support and condemnation have prompted the immediate release of the six teachers. They were able to pass the checkpoint with the help of church workers. “We thank everyone for responding to the alerts,” TRIFPSS said. Meanwile, Jolita Tolino, a Dulangan Manobo is still languishing in jail after her arrest on Feb. 7 at sitio Chiris, barangay Sangay, Kalamansig, Sultan Kudarat. Geming Andrea Alonzo, CLANS executive director, said Tolino was slapped with trumped up charges of murder and frustrated murder. She was arrested by members of the MBLT 2 and Kalamansig Police. Alonzo said Tolino is a volunteer teacher deployed at sitio Tinagdanan, barangay Hinalaan, Kalamansig, Sultan Kudarat. Alonzo asserted that the accusation against Tolino was false, as the said murder of MBLT 2 elements happened on March 20, 2017. She said Tolino was in fact attending a Teachers’ Evaluation and Curriculum Development activity on the said date. Salinlahi and other child rights advocates, on the other hand, vowed to intensify their support for the Lumad struggles. “The AFP should expect that the broad alliance supporting Lumad schools will match their intensified military attacks with stronger resistance,” Bonganay said.